As climate change continues to unleash increasing amounts of rain on the city, its engineers battle to keep one of the world's best underground drainage systems up to the job, writes Sylvia Chang. With up to 3,000 millimeters (mm) of annual rainfall, Hong Kong is one of the soggiest cities in the Pacific Rim. The rains come in May, with the fogs and mists suffusing the ceramic tiles and window frames of the city's shoebox homes, soaking the densely packed city with over 300 mm of rain for every one of the next five months. With the rains come floods and landslips, as the torrents cascade down the city's steep mountain slopes which account for 60 percent of the city's natural terrain. There are typhoons and torrential rains 10 or more times a year - from the Amber rainfall warning, with downpours exceeding 30 mm in an hour, up to the danger zone of the Red and Black warnings which bring torrents of more than 70 mm in an hour and when only the foolhardy venture forth. People seem undeterred by the imminent danger of floods that may follow when rainfall seems to reach the point of madness. Some actually welcome the news, in recognition of the fact that the warnings of imminent danger increase the chance of an unearned day off. Scientists say it will get worse, with tropical deluges becoming more frequent and of greater intensity. The experts want people to educate themselves about the dangers. Meanwhile, the engineers battle to keep up, adding improvements to what is acknowledged to be one of the world's best underground drainage systems. They know for sure that the city will remain under imminent threat. At those times when the city seems beleaguered by the deluge, a city under the ground is responding at full capacity. The city's flood control system, senior engineer Richard Leung Wah-ming explained, functions on three major systems, to ensure that the city can stand up to the kind of savage rainstorm that's likely to come once in 200 years. Leung is with the Land Drainage Division of the Drainage Services Department (DSD). At the upper levels of the city, concrete buildings, roads and pavements are heavily packed onto the mountain slopes. Stretching along the slopes there are four rain tunnels, five to seven meters high - large enough to run a double decker bus through. Torrential rain on the upland surface is diverted away from low-lying areas downstream. The floodwaters are collected and put to good use in the city's water system or are allowed to drain back into the sea. At the mid-levels, where more of the population is concentrated, three underground storm-water storage tanks are designed to open their gaping mouths to swallow the rainwater. Two have been completed and are operational. The largest, at Tai Hang Tung in West Kowloon, was excavated to a depth of over 10 meters. It's capable of holding 100,000 cubic meters of stormwater, almost equivalent to 40 standard swimming pools. Composite image showing the location of the Tai Hang Tung underground flood storage tank. The underground storage tank beneath the Happy Valley racecourse is still under construction. Once completed in 2018, it will have a capacity of 60,000 cubic meters. That's enough to sop up the drainage from the entire 130 hectares of Wan Chai, Causeway Bay and Happy Valley, even if it's the kind of nasty downpour that happens only once in 50 years. Leung of the DSD explained the storage tanks contain water-level sensors, culverts and tide gauges which operate automatically according to the real-time data of water flow and tidal levels. When the rainfall intensity is low, the weirs of the tank are kept closed and stormwater flows along the culvert. When it rains heavily, the weirs lower automatically to allow stormwater to overflow into the tank for temporary storage. After the flood has passed, the weirs will be lowered further to allow the stored stormwater to flow back, while the remaining stormwater will be pumped out. At the lower levels of the city and in rural areas, drainage channels are enlarged and dredge sewers are straightened, stretching out like a web totaling 360 kilometers in length - equivalent to the air travel distance from Washington, D.C. to New York. The underground world is like a concrete root system which maintains the health and longevity of the city above ground. The roots of the system - sewers and storm-water drains - which run about 1,700 kilometers and 2,300 kilometers respectively, spread throughout the city and offset most of the flood hazards. All major flood "black spots" have been neutralized, and the number of danger points, posing different degrees of danger, has been reduced from 90 in 1995 to eight this year, according to statistics from the DSD. The department also deploys standby contingency teams during severe weather. "They dash out to monitor, inspect and record locations where flooding is reported. They discuss the situation and move forward to tackle problems," Leung said with evident pride. Even with the world-class standards, Leung said the flood control systems still face severe challenges in the face of the ever-changing global climate. Scholars, after all, say we face even more extreme weather at much higher levels of intensity as climate change progresses. 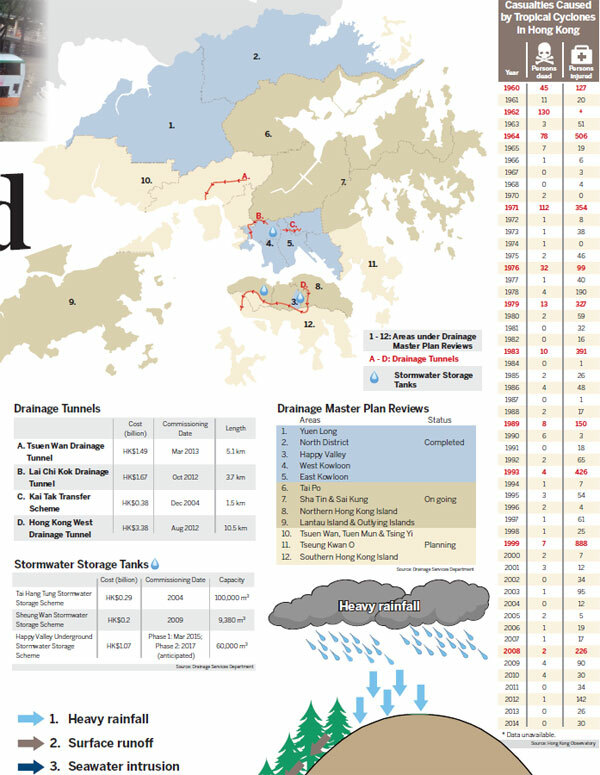 As statistics from the Hong Kong Observatory show, rainfall records are constantly broken. In the period between the 1880s and the late 1970s, the maximum hourly precipitation records at one time, would stand for 40 years on average. This was reduced to less than 20 years between the late 1970s and the 1990s. The records began to be broken every 10 years, or less, between the 1990s and 2014. "This means that climate change is really accelerating," Leung emphasized, urging people of all sectors to face it squarely. 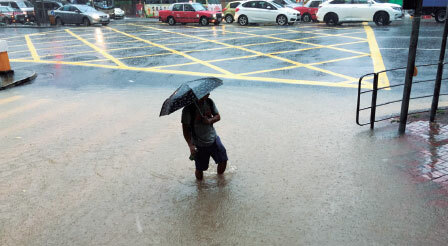 According to the Hong Kong climate change report released in November 2015, the number of extremely wet years is expected to increase from three between 1885 and 2005 to about 12 between 2006 and 2100. The estimation draws on the scenario outlined in the latest report by the Intergovernmental Panel on Climate Change (IPCC) under the United Nations. Leung said the DSD is using the combined data from the IPCC and Hong Kong Observatory to review Hong Kong's flood prevention system with regard to climate change. "The capacities of the current rainstorm tanks and channels may not be able to hold heavy rainstorms in the future. Together with the changing land use and new urban design, we need to update the current systems," Leung said. On Oct 19, a Black rainstorm warning was issued, the first ever during the month of October since the warning system was put in place in 1998. Hong Kong Observatory said the hourly rainfall exceeded 100 mm, far above the threshold of 70 mm for the Black signal. The total rainfall on that day reached 223 mm, in a city with an annual rainfall between 1,400 and 3,000 mm, depending on the district. The downpour struck suddenly and in only a few areas. The wind whipped, and the sea churned at the Victoria Harbour front. Trees were uprooted at Kennedy Town. There were floods in 14 areas, including three which severely disrupted traffic and caused property losses to nearby residents. Chen Ji, associate professor at the Department of Civil Engineering at the University of Hong Kong (HKU), observed the water of floods was muddy and clay-colored. This is history repeating, he said, six years on from June 2008 when heavy rainfall struck and caused floods with soil-laden waters in several locations. Inside the Haking Wong open podium at HKU in June 2008, Chen recalled that he noticed the sump pits underground. Based on his many years of experience, Chen understood a landslide must have occurred nearby, creating a blockage of the drainage system. 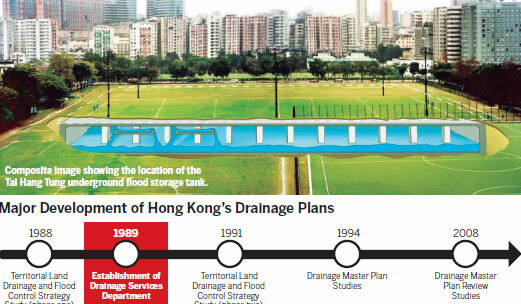 Judging from these two incidents and several others of less intensity, Chen said, "The most, most significant thing to consider for the future of flood prevention in Hong Kong, especially in urban areas, under the threats of climate change, is how to prevent floods caused by landslides and debris which lead to blockage of drainage systems." The preliminary findings by the DSD confirmed Chen's judgments. Responding to the Legislative Council on Nov 23, Secretary for Development Paul Chan Mo-po said, "A considerable amount of tree branches and leaves were torn down by strong winds and accumulated on the slopes upstream. They were washed down subsequently into the catch basins and storm-water drainage systems downstream by the severe rainstorm on Oct 19, resulting in blockage of the drainage systems, and hence undermining their overall flood-relieving capacities." Further inspections and practical solutions on future potential incidents are still under review after two months, according to Leung of the DSD. "We need detailed data on exactly how much rainfall was recorded at exactly what time, and we need to test if similar circumstances could happen again," he said. The current standards of flood prevention for the planning and design of storm-water drainage systems are based on analysis of historical data and thus, as scientists say, have their limitations on the future flood control strategy. "Due to the uncertainty of climate change, or even the natural system, the frequency and intensity of rainfall are hard to predict. 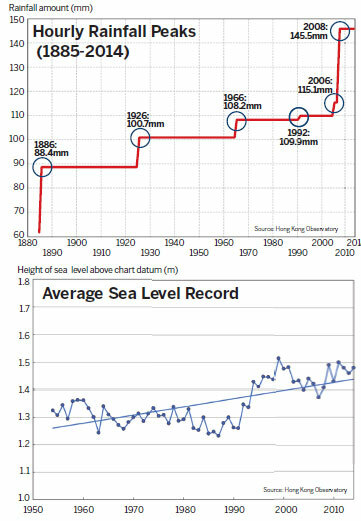 It is highly possible that a once-in-200 year rainstorm could become a once-in-100 or once-in-50 year event," Chen of HKU said. Usually, rainstorms strike Hong Kong in summer, between May and September. This year, however, with successive typhoons in October, it rained heavily in the normally dry month. This abnormal weather, Chen explained, was due to a strong occurrence of La Nia this year, an atmospheric phenomenon which aroused more tropical cyclones and brought above-average rainfall to Hong Kong. It is possible this phenomenon could become more frequent under the impact of climate change, Chen said. "So it is important to enhance the accuracy of seasonal forecasting of heavy rainfall in the dry season so that the DSD can take all precautions to mitigate the impact of floods that possibly may occur." While scientists are wracking their brains to find ways to improve the accuracy of flood forecasting under the changing climate, there are architects who have accepted the future uncertainty and begun to make their own projections. "Flooding is inevitable in the future. It is time to think how to adapt to it," said Liao Kuei-hsien, assistant professor in the School of Architecture of the Chinese University of Hong Kong, suggesting that the manmade surroundings be designed to be floodable and that more public space, especially in urban areas, be multi-functional so it can be opened during rainfall for storm-water storage. Liao clarified the differences between flooding, a natural phenomenon, flood hazard, a potential threat of flooding to human beings, and flood disaster, which causes damage to residents and the economy. As the current flood control systems are insufficient to sustain future flood disasters, it is important "to increase the resilience of the city and to prevent flood hazards from becoming flood disasters", Liao said, explaining that resilience means a city in flood recovers quickly and continues to operate normally. "We'll be living in an environment where flooding is natural. So we need to get used to it. Just let it flood," she said, anticipating an environment which adapts to floods.